In case some of you have not spotted it Alan Morison and Chutima Sidasathian of Phuketwan have been accused of libel and libel under the Computer Data Act by a Captain Panlob Komtonlok of the Royal Thai Navy in relation to part of a Reuters report on the plight of the Rohingyas. 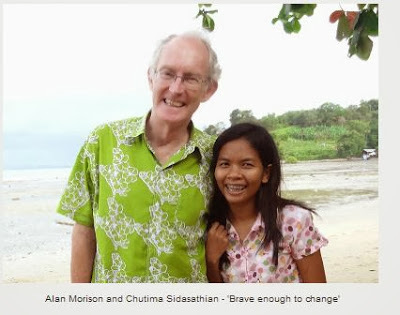 Alan and Chutima have led the field and have been consistently leagues ahead of the other media in their investigations of what happens to the Rohingya from Burma who are landed on Thailand’s shores. So this action is galling. Alan has put up a spirited defence and it seems quite clear the Royal Thai Navy should not be in a battle with the intrepid duo. But the use of the Computer Crime Act, as readers of this website will have already gathered, to attack journalists is getting more and more common. In most countries even libel is only a civil offence. Here the Thai authorities have made the game even worse. The land of the free? 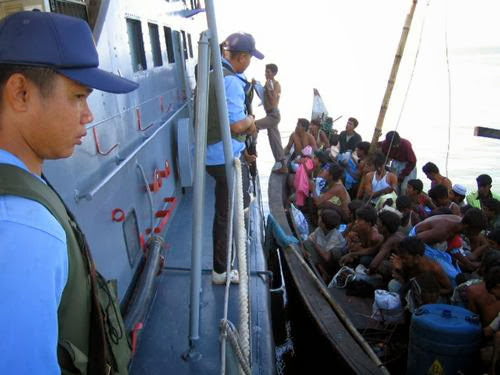 I understand in the complaint the lawyers have translated Thai military into Thai Navy when in fact the more serious allegations relate to what happens to the Rohingya when they are actually in Thailand –not floating off shore – although CNN did do a report about the Rohingya being pushed out to sea by, er, people in uniform with boats. So we should all support journalists who are doing a difficult job here under laws which best suit a totalitarian state. Agree this law is a travesty of rational democratic principals, and agree we should support journalists who are working for a common good. Some however, I suspect are working to increase their site's hits for personal profiteering which is certainly OK, but this man's wildly abusive tone to his readers has me unable to feel empathy for him in this case. He is seeking publicity on a global scale, is apparently prepared to pay a high price for it and now he shall have what he wished for. I think you might be going for the overkill on this Christy…because perhaps some of A's comments to readers wind them up even more. That's not really central to the issue here. No not central ,but certainly pertinent. He wants attention and publicity and is going to great lengths to achieve it. It should have been disclosed from the beginning when the text was posted that the articles were written and researched by Reuters. Was this a tactic on his part, or just irresponsible journalism? Actually, isn't passing off text you haven't written also known as plagiarism? So bad when Thai executives do it, but OK for publicity seeking bloggers ? Does anyone really believe he will go to jail? He will have to spend money, as you have to- proving the allegations (if they are indeed true), and it will be decided it was for a public good. Case closed, a few awards , lots of sympathy and assorted support. I agree Alan will probably get little sympathy from a lot of people. I'm not his biggest fan either but in this case he's being persecuted for telling the truth. He's obviously telling the truth to get this kind of response. Instead of an investigation we'll get the usual cover-up, white-anting and scape-goating. He's lucky he only got a law-suit, the last Thai reporter who named names got a bullet.